Booklets - Pads - Draw Tickets, etc. 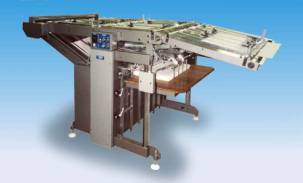 Sheet Inserters are designed to introduce sheets into the main flow of sheets on a printing or other type of production line. This may be in order to protect a product as in printed circuit boards or as an additional sheet such as backing or cover sheets in pads. Pads, booklets, raffle/draw tickets, etc. there are many unique applications in product finishing. 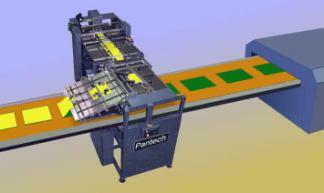 The inserters are fabricated using the same basic construction as is used in our feeders and stackers. This allows them to be easily combined to form a wide variety of specialised configurations. Auto Feeders sheet inserters are free standing units requiring the minimum of electrical or mechanical integration. These units are available for inserting from under, over or from the side of the product conveyor.